He’s Actually a Snake Skin. Get it?! Snakeskin?! Since his debut in 1991, Deadpool quickly became a favourite of comic book fans. His quips, sense of humour, and ability to break the fourth wall won everyone over. He became a household name among the likes of Superman, Batman, Captain America, Spider-Man, and Iron Man. Deadpool has found his way into other superheroes’ comics like the Avengers, Daredevil, and Heroes for Hire. Being able to break the fourth wall, Deadpool knows what he is: a parody of the superhero. He’s done it all; comic books, movies, video games, and now there is a Super Smash Bros. Ultimate mod that brings him to the series. Look! Superhero landing! The mod is made by Demonslayerx8. It is really just a Deadpool skin over the Solid Snake model. In their video, Demonslayerx8 shows off Deadpool in action, using Snake’s moves. They compliment the Deadpool skin surprisingly well. The hand grenade and remote missile are weapons that Deadpool might actually use. Unfortunately, Snake’s victory quotes are still spoken, but hopefully Demonslayerx8 can work some magic to give Deadpool a Ryan Reynolds line or two. 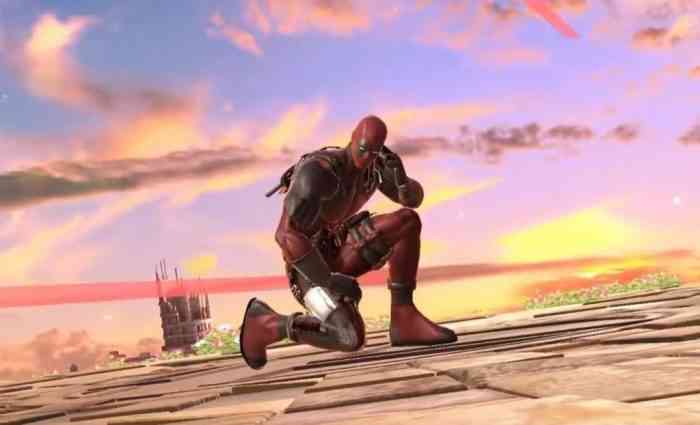 Deadpool being brought into Smash officially is not entirely off the table. With Marvel: Ultimate Alliance 3: The Black Order being exclusively published by Nintendo on the Switch, there is a possibility. Deadpool is not first SSB mod Demonslayerx8 has made. For the SmashU they have made Yoko Littner from Gurren Lagann, Shantae from the Shantae series, Nico Robin from One Piece, and many others. You can view them all on Demonslayerx8’s YouTube channel. What do you think of the Deadpool skin? Or any of the other skins Demonslayerx8 has made? Let us know in the comments below. And be sure to keep up to date with all our SSBU news on our site.